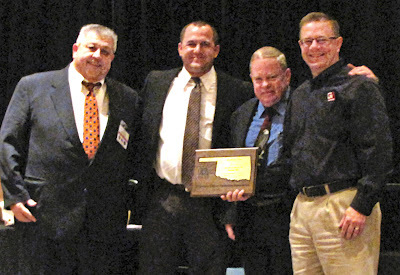 The Oklahoma Airport Operators Association has given its President's Award to Garver Aviation Team Leader Curtis Brown, PE (far right in picture). The honor recognizes one person for service that promotes and enhances the association. This year, Curtis received the award for his hard work contributing to the 2012 OAOA/FAA Partnership Conference. Curtis, who is also serving as the OAOA corporate director, has served as audio/visual liaison for 10 years. At this joint conference, he was responsible for the purchase and lease of audio and visual components for eight general conference presentations and twelve conference sessions in two rooms. This included making sure that the computers, microphones, speakers, screens, and slide shows worked well throughout the conference. The conference, sponsored by the FAA, OAOA, and Oklahoma Aeronautics Commission, invited industry leaders to present sessions on topics such as wildlife management, airport marketing, pavement management, the airport improvement program, and the aeronautical study process. In addition, he has used his skills to coordinate the audio and visual needs for Oklahoma Governor Mary Fallin, several Washington D.C. representatives, numerous FAA-SW Region speakers, and regional industry experts.